The Doogie Collection is simply one of the most unique gift concepts on the market today. Our patented interchangeable, locking o-ring system allows customers to create almost 20,000 different DOOGIE designs. With over 200 different dog breeds, 8 cat breeds, and 4 animal species combined with 20 Doogies in Motion Vehicles and 111 Professional, Sport, Special Event, Musician, Uniformed, and Destination figurines, we're sure to have something for everyone. Let your dog walk in YOUR shoes for a while. Each head is made of stone resin and hand painted. Each head measures about 2” tall. 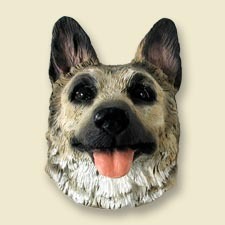 Add any Doogie head to any Doogie body or vehicle to customize your figurine.